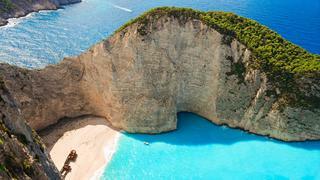 The Ionian Islands stretch southwards from the Albanian coast towards the southern tip of the Peloponnese, lying off the west coast of mainland Greece. 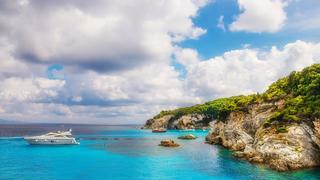 Scattered in the Ionian Sea, which on some charts is also called the Adriatic, the main islands of the chain, from north to south, are Corfu, Paxos, Levkas, Ithaca, Cephalonia and Zakynthos. The climate here is very different from the stark barrenness of the Cycladic isles and this makes chartering a superyacht in the Ionian Islands much more enjoyable, with mild winds, crystal clear blue waters and predictable weather patterns that create perfect sailing conditions. The above-average annual rainfall results in a green, lush landscape, with mountainsides carpeted in orchids and wildflowers, interspersed with olive groves and cypresses in the springtime. Winters are mild and wet, but the summer months can be extremely hot as the islands do not receive the meltemi wind that cools the Aegean Islands. 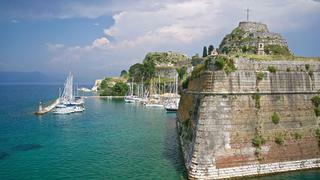 Day 1: Corfu After you fly in to the International Airport, your crew will bring you to your waiting yacht in the NAOK yacht club on the south side of the Old Fortress. You might like to take a drive to Corfu Town, the capital, which is beautifully situated on a promontory on the east coast, dominated by the Neo Frourio (New Fortress). Your lunch stop is likely to be at Garitsa Bay, and in the afternoon you can go ashore and visit the ancient city further south, then take a drive on the road running above the seafront that passes the old royal palace. Another attractive excursion is to the villa of Akhillion, further south. This Italian-styled Renaissance building is situated in the hills and offers panoramic views from its magnificent gardens. The remains of a Roman villa lie further south in the charming fishing village of Benitses. 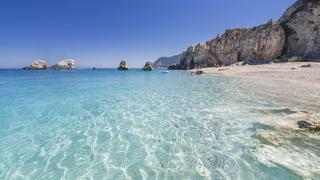 The island has something to offer everyone from the lively nightlife of Kos to the excellent sandy beaches and the rugged mountains. Chartering here offers you the opportunity to view loggerhead sea turtles in Zakynthos, party the night away at Corfu’s notorious Pink Palace complex, enjoy walking trails and traditional mountain villages on Levkas, and relax on any number of beautiful unspoiled beaches or follow in the footsteps of Homer’s Odysseus on Ithaca. Levkas boasts one of the top windsurfing resorts in Europe, while Cephalonia’s magnificent Myrtos Beach is widely regarded as being the loveliest in the Mediterranean. 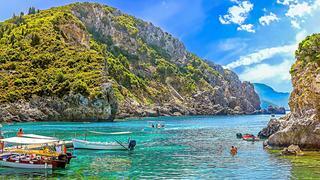 The two best-known islands in the chain are Corfu and Cephalonia, which unwittingly acquired an army of fans worldwide after the publication of the book Captain Corelli’s Mandolin and the subsequent movie. Each of the Ionians has its own distinct character – between them, they provide the perfect playground for a superyacht charter. The next morning, you’ll head southwards 30 miles towards the mountainous island of Levkas with its stretches of golden beach. The island lies off the Playia Peninsula in Acarnania, from which it is separated by a shallow lagoon. A range of hills, the largest of which is Mount Stavrotas, dominates the island and runs in a southwest direction, ending at Cape Dhoukatou. In Greek mythology, it was from this location, on a promontory called Leucadian Rock, that Sappho flung herself for love of the handsome Phaon. With yacht docked in Lefkas town or Nydri you will enjoy a lazy day here – it’s a gorgeous spot for sunbathing on the beach and enjoying the water for the afternoon. Today you’ll head north about 32 miles towards mythical Ithaca, a rocky island separated from Cephalonia by the Ithaca channel. 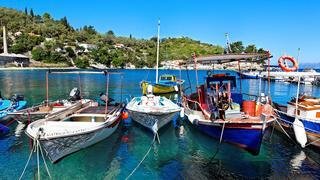 On its east side, is almost cut in two by the long Gulf of Molos, which offers several marvelous anchorages. Make the most of the advantages of yacht charter by taking the tender to the uninhabited Atokos Island for a picnic lunch ashore before you carry on towards Zakynthos for the night. With its beautiful scenery and excellent bathing beaches, the island is very popular with holidaymakers and is a popular Mediterranean party destination. Ashore, you can visit the famous blue grotto and the old frescoed churches. For convenience your yacht can anchor off the port, but if you’re looking for peace and quiet, ask the captain to drop the hook in Smugglers Cove. 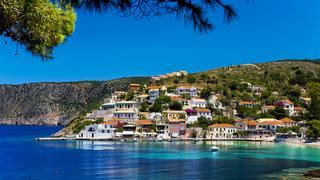 About 50 miles away from Zakynthos, Kephalonia is the largest of the Ionian Islands, yet has only 32,000 residents who work in the tourist trade and farm the limestone mountains that rise to the 5,341 foot Mount Ainos. Despite the annual influx of visitors, the island is so big it’s still possible to get away to places where you are unlikely to meet a soul for days. In a catastrophic earthquake in 1953, entire towns and villages were destroyed, more than 600 people died and thousands where injured. If you’re interested in archaeology, there are excavations of Mycenean graves that shed light on a civilization developed thousands of years ago. For those who do not share this passion, take a tour of the island to take in the peaceful town of Lixouri, the beaches on the south side and the sociable capital of Argostoli.